Each recording is a dedicated recording of a class sequence I’ve already taught. You receive excellent sound quality, it’s not a public class with a lot of background noise, and you know others have liked and benefited from the sequences. Each class recording comes as a mp3 digital download with a PDF of the class sequence. 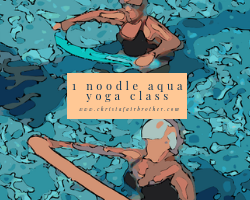 This is a 46 minute aqua yoga audio recording for a 55 minute aqua yoga class. It uses one pool noodle as a prop and takes you through a sequence designed to warm up your spine, improve your balance, and open your hips. A one noodle class is an excellent place to start, because you have a prop to offer a little security for your balance, but it’s not too much to manage. You can purchase this recording in my store HERE. If you’d prefer a bigger set of resources, enroll in my aqua yoga eCourse opening Spring 2019. Get all the details HERE.